Yay, Summer! And An EPDM Roof Update. I had such a simple plan in mind. 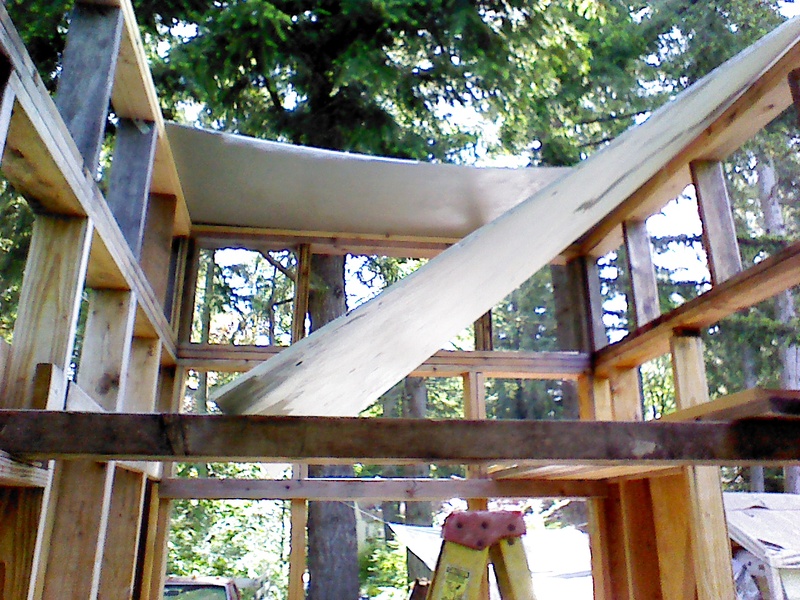 Some dimensional lumber trusses laid straight across the top plates, covered with simple panels of plywood, followed by simple panels of rigid insulation, and covering that in turn with a single sheet of EPDM. I thought I was prepared with the proper adhesive, plenty of fanfolded insulation, the proper nails and screws, all that. I was wrong. This would be a good place to make a sandwich to eat while reading. It’s a longish post. 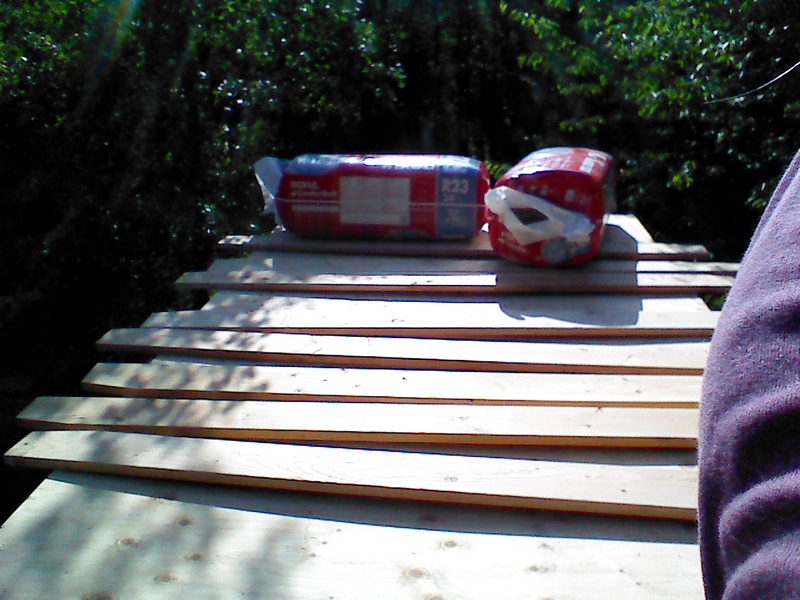 First, of course, there is the extra layers I’ve already added, that make up the insulation sandwich. 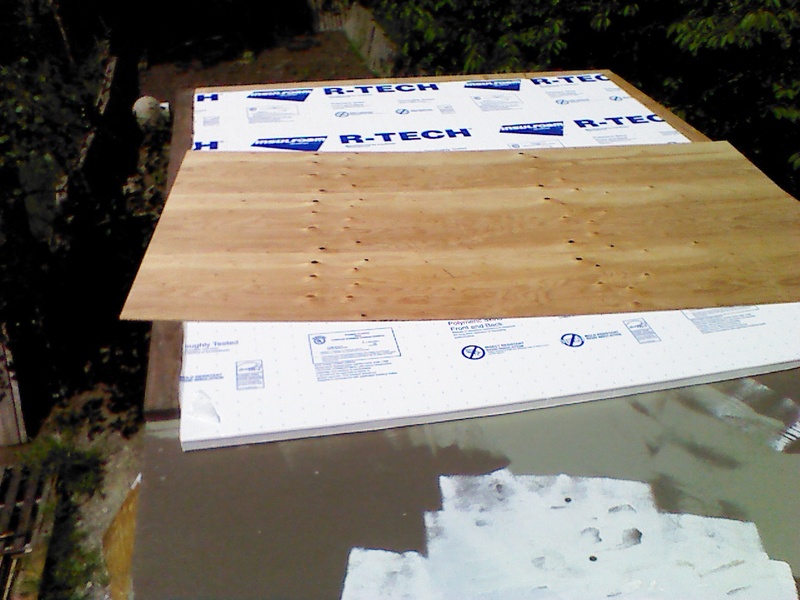 They are really important to break thermal bridging, but add expense, labor and height. Next, it turns out the fanfolded insulation I have “might” not be the correct kind for my brand of EPDM (it’s hard to know for sure because my manufacturer has been absorbed by Firestone, and their requirements “might” be different ~ it’s common with EPDM manufacturers to each have very narrow and specific needs for each brand). 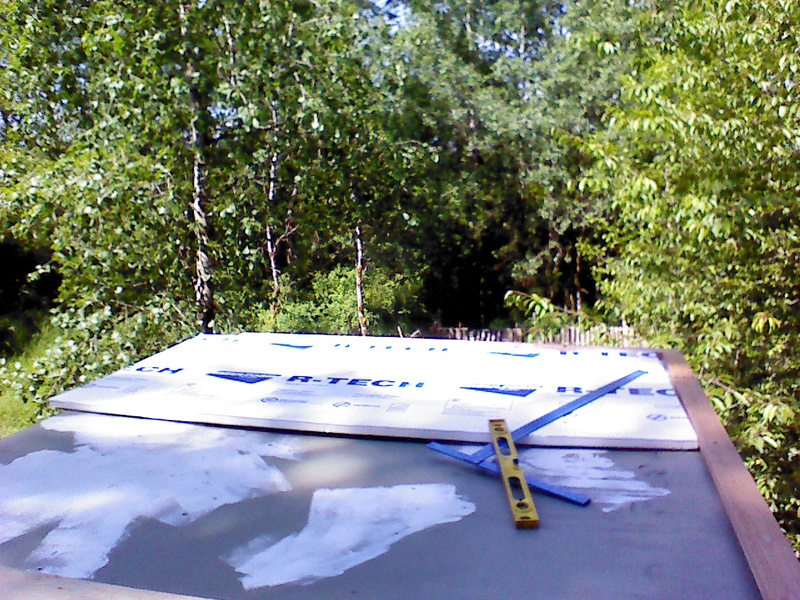 The safest route is to use 6 inches of polyisocyanurate insulation on top of the roof deck, and fully adhere the rubber layer on top of that. Uh, oh, I don’t have 6 inches extra height to spare. Plus, that’s OMG expensive. I’m feeling a little panicky now. 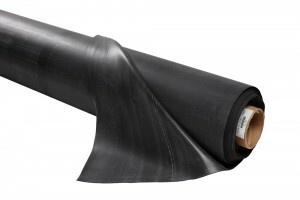 After much investigation, it seems most brands of EPDM can be applied directly to wood, but only smooth-as-silk wood like Fiberboard, which is a very bad product to use in this wet environment. So add more hours of investigation. It looks like silicone is compatible, and can (probably even should) be used to fill all holes, gaps and cracks larger than 1/4 inch in the plywood decking I have to create a smooth surface. So, off I go to buy silicone. Not the mixed stuff, only pure silicone, since I couldn’t find evidence confirming the compatibility of the mixed stuff with EPDM. So I buy several contractor tubes of silicone and a spatula thing to smoosh the stuff into crevices. FINALLY, ready! Oops, no. 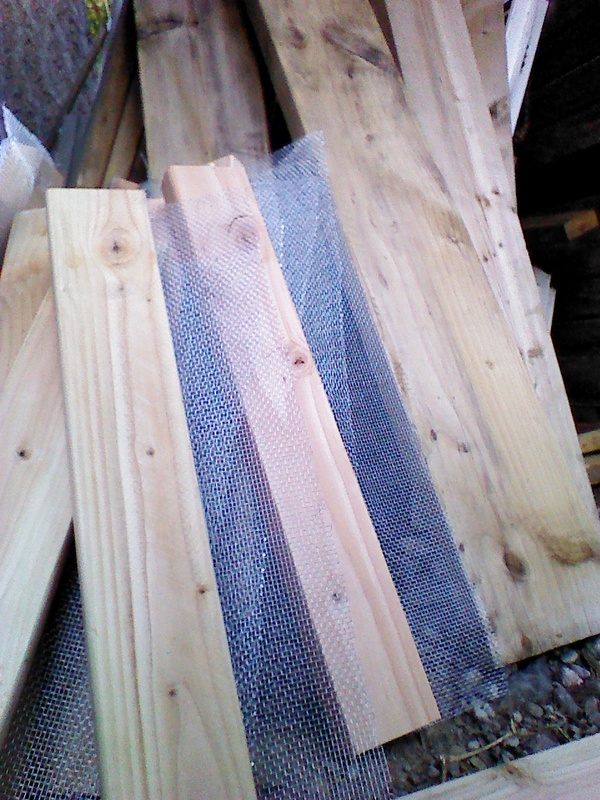 Any and all splinters or rough bits need to be sanded off or there’s a risk of the rubber tearing. Fine. I do some research and buy a powered sander. Hand sanding will take forever, and sunny days are rare and precious here. I’ll need to sand the barn wood interior anyway, so this extra purchase doesn’t dismay me, not too much. At this point things get fuzzy. I literally can’t remember why exactly I deemed it necessary to purchase a gallon of liquid EPDM, I really can’t…somewhere in here my doctors changed my meds and I sleep-walked through a couple weeks. 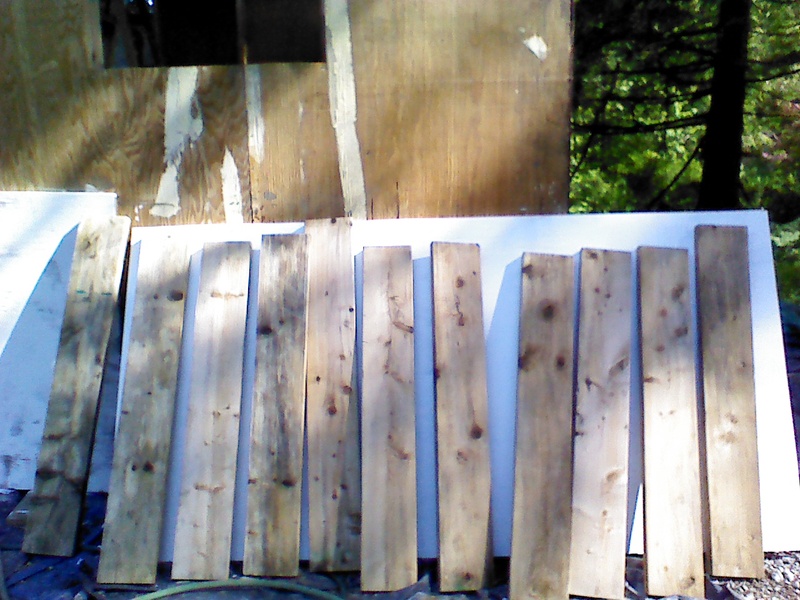 But I bought the stuff and am going to brush it onto all the plywood edges for waterproofing and over the clips to soften their sharp edges. 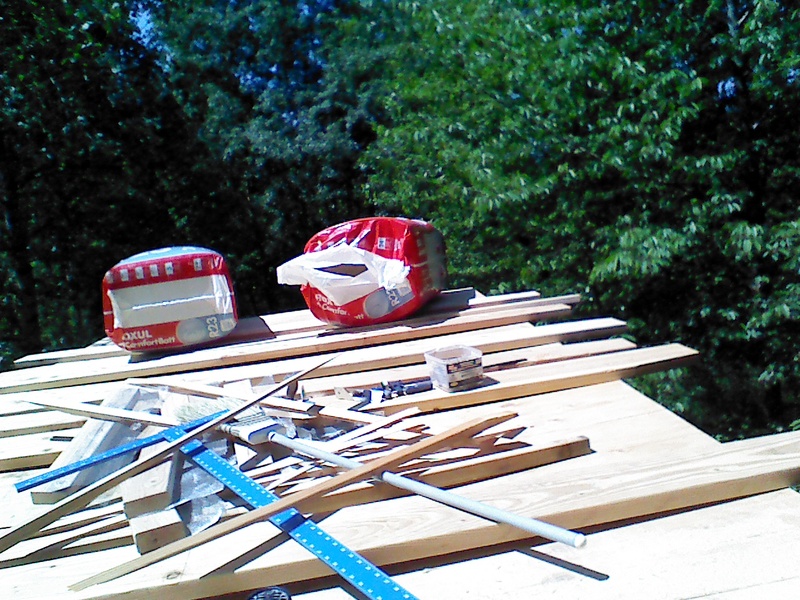 Somehow I’ve gone far astray from my “simple” roof solution! Tomorrow is supposed to start a week of dry sunshine, all my newly purchased stuff has arrived, and my knee is down to a dull ache. My plan is to sand, sweep and silicone. I have no idea how long it will take, but hopefully not more than a day or two. Fingers crossed! Taking a cue from Macy over at minimotives, I’ve decided to write about safety in a Tiny Home. People ask me about it when they find out about my build, and I’ve seen lots of questions in various blog’s comments. Although my Oliver’s Nest isn’t livable yet, I feel entitled to address this issue, as I live in a (even Tinier) truck camper while building her. So. first off, privacy. It’s related to safety, if you think about it. Who feels safe with no place to get away from everything? To hide? To really relax? I can only do what most people do, close curtains and lock the door. Here in this camper though, those normal things doesn’t really cut it. The walls are thin, so sound carries both inwards and outwards too clearly. The windows are single pane, and some of them won’t seal close. When the wind gets to really gusting, the whole place jerks sideways with a booming sound, and if there’s an electrical storm nearby, I get to feeling a bit tense with those sound effects! Oliver’s Nest, on the other hand, will have 6 inches of insulation in the walls and floors, and over 7 inches in the roof. I’m positive that sound will be damped by the thick sheep wool insulation. The whole structure is heavy, and sits solidly on blocks. The double-paned windows aren’t installed yet, but no doubt will be more effective than the campers are. During strong winds she doesn’t even creak. Wind and storms be damned in there! House fires. That’s a scary one. Although I haven’t read of any fires in a Tiny Home, even those with wood stoves, odds are someone will have to contend with one at some point. I’m doing my best to ensure it isn’t me. In such a small home, even a small fire could render it unlivable. It’s taken a lot of thought on where exactly to locate the wood stove so that I can make the minimum recommended clearances on both it and the chimney. 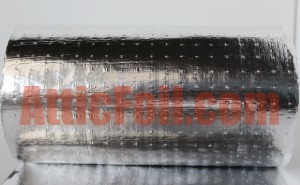 The insulation behind the stove and chimney will be Roxul (rock wool) which is completely non-flammable. I’ll have the required heat shield with an inch of air space to the wall. I’ve discovered pretty chimney guards to help prevent contact burns. I’ve thought about the weight (and my home is already quite heavy), and have decided to place it over the axles. Interior gravity-fed water storage tanks will be located nearby (overhead, in the loft) for additional insurance against disaster. Lastly, I have a plan in mind for a metal roof to be added after Oliver’s Nest is moved to her permanent location, to cover the EPDM. And what about scary events like forest fires, or random disasters like the girl who lost her newly-built Tiny Home to a barn fire? Once again, such small homes can be quickly ruined. How to best prevent these things from happening? I’ve already spoken to one of the forest rangers local to my property to find out what they suggest for protection. It was a surprisingly reassuring conversation, given the history of severe forest fires in the area. He gave me great advice and I’m a bit less worried, as I know now how to best protect my home. I can only hope everyone is also careful, no matter the size of their home. Moisture, as I’ve said about a million times, is a real problem here in the Pacific Northwest. It’s imperative that any home in this area be built to withstand water intrusion from every angle. This comes under Safety, as mold, mildew, rot and their attendant pests are not safe or healthy to have in your living space. If the rot gets bad enough, you can end up with not much of a home at all. On to the question of having my home towed away or broken into. Honestly? I think it’s a valid concern. There are uncool people in the world who think nothing of taking what they want, and messing with what’s left. The good folk over at Solar Burrito Blog had stuff stolen from their building site while they were away, and that can happen to anyone, especially those with an attractive target like a Tiny Home in a more rural setting. I’m not worried too much while living here, as there are three large dogs, lots of neighbors, and my home doesn’t show from the road. There’s also the old tires on the trailer….replacing them will be an unavoidable expense, but for now helps keep my home safe. I will be removing the wheels once on my own place, which only solves part of the problem. Keeping a safe home in a very rural place isn’t just a worry for Tiny Housers. I have to hope that strong fences, big dogs, a low-profile, and knowing how to use a gun (with appropriate scary signs) will keep me safe from all sorts of predators. One last safety feature I feel strongly about: having two methods of emergency egress. Some people make do with windows for an emergency exit. Some apparently don’t allow for emergencies at all, from looking at their tiny little windows. I have two doors (not yet installed) on opposite ends of my home. I made the trade-off of useful interior wall space for safety. It has made planning out the interior much harder ~ I admit to working out plans with only the one door, which allowed for more counter space in the kitchen, or a fully enclosed bathroom, or a much larger closet ~ but kept coming back to wanting quick access to the outdoors. So, one end of Oliver’s Nest will have a full wall of windows due to the french doors that I’ll be able to open out wide onto a large, covered patio area. The other end will have a dutch door with a window in the top half. This door will open inwards (in the event of deep snow), let in more light, and give me quick access to the “mud room” area of my little home. I feel good about my design. I’m really curious about how other people feel about these subjects. Please feel free to comment on your own thoughts and solutions!